We (The Mustang Messenger) wanted to wait until the competitive marching band season came to a close before we publishing this piece, which has been in the works for a while. As the Cypress Ranch Mustang Band are 2018 area finalists (no small feat in this region), this piece has been reworked. If you’ve ever been to a Cypress Ranch event, you’ve likely heard the bombastic, bassy anthem of the Cypress Ranch Band thundering throughout the venue. Whether it be at a football game (#MWT) or a pep rally, the Band have a signature sound and are one of the pillars of fine arts at Cypress Ranch. But developing such a sound is not easy. Band — while on the surface is a simplistic elective — is much more complex than most people give it credit for. Spanning across multiple periods and hours of outside-of-school practice, Band brings together over one hundred musicians to perform together, whether for a large audience or for competition. I went down to the Band room to see Mr. Holcombe, the lead director of the Cypress Ranch Band. As the head director, Mr. Holcombe oversees the entirety of the Band, and also works with his assistant band directors: Mr. Siegrist, Mr. Greene, and Ms. Kaminski. Band is an ensemble that plays a select array of instruments, which primarily comprises of wind instruments and percussion instruments, such as the trumpet, cymbals, clarinets and the ever-notable bass drums. The selection of instruments are primarily exclusive to Band, with string instruments — as well as some select wind instruments — considered Orchestra. Speaking of Orchestra, it may be easy for students who aren’t within the musical world to mix up the two organizations. Mr. Holcombe explained to me how the two differ in not just their instruments, but also their performance opportunities. “Because of the nature of the instruments, [Orchestra] performing outside is not a good thing,” Mr. Holcombe explained further. But in terms of playing in rhythm and with emotion and direction, Orchestra, Band, and Choir all share those traits. Separate from the main ensemble is Color Guard, which is formally a part of the Band. Color Guard coordinates dances, mainly with flags, sabers, and rifles; that pair with the music played and are important to the visual aspect of a marching band production. While Band is easy to define, Band members are a lot more varied. The only universally shared trait among Band members is a passion for music. But even with Band’s diverse assemblage, the common love for music shines through, with the total ensemble still performing exceptionally well at events and in competition. It should be fairly obvious to the common student that being in Band requires playing an instrument of some kind — unless you’re in the Color Guard (and even then, a lot of Color Guard members also play instruments). An overwhelming majority of Band students transition over from middle school, and typically retain the instrument they played back at their previous school. However, certain instruments only allow a certain amount of people to use them (limited instruments, limited space, limited spots) and require students to go through an audition process. During the school year, students learn how to play music. Students typically rehearse with other students during their Band period, however, it can vary depending on the period they’re assigned. For grading, students are graded based on their final performance, rather than through a quiz or a test like most “traditional” classes. Band’s performances vary depending on the current semester. For the Fall Semester, Band primarily works in conjunction with Football, as they play extensively at Pep Rallies and also at Cypress Ranch Football games during halftime, playing the school Alma Mater and the Star-Spangled Banner. 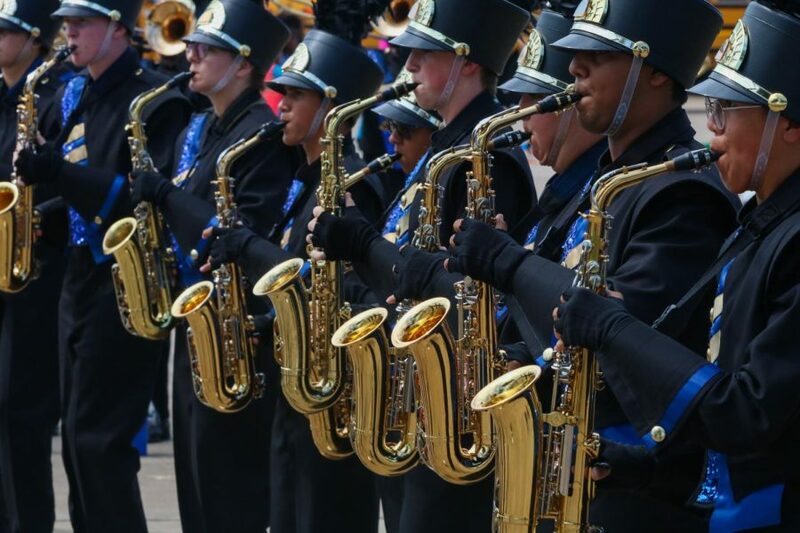 These marching performances are done in preparation for marching competitions, with Band participating in several competitions around the Houston area, including the UIL marching competition. In the spring semester, Band focuses on competition and accuracy rather than entertainment in front of thousands of spectators. Band plays in concert groups, which also have a UIL competition. The semester also features multiple individual competitions which students can participate in. Lastly, the spring semester has Solo-and-Ensemble, which is a competition that allows students to play alone and in groups, with the size of groups ranging from three to more than twenty. The Color Guard also have competitions during the Spring semester, where the compete against other schools in different types of routines. Every part of Band has sort some of competition or event throughout the entire school year. What does it take to be in Band? Being in Band is no simple task, requiring lots of time and dedication. While Band isn’t perceived as a cakewalk by most students, many Band members argue that people underestimate the amount of time and effort required to participate in Band. A little recognition never hurts. But the time you dedicate to Band is not entirely based on a schedule taped to the wall. The time members dedicate to Band is mostly decided by the members themselves and how much they want to practice their instrument. Why do people play in Band? As a common fine art, Band gives many opportunities for students following their departure from High School. Scholarships are provided by some universities to Band students, seeking to capture the talent for their own performances at college events. But Band is not just about the music. It is also about developing skills required to overcome obstacles and working towards a goal, both alone, with groups, and with a full ensemble. Some Band members don’t see practice as laborious, but rather a fun challenge to overcome. Universities also focus on this too; dedicating hours upon hours of time to an activity such as Band for several years shows a level of commitment and discipline, which many schools may see as extremely desirable in students. 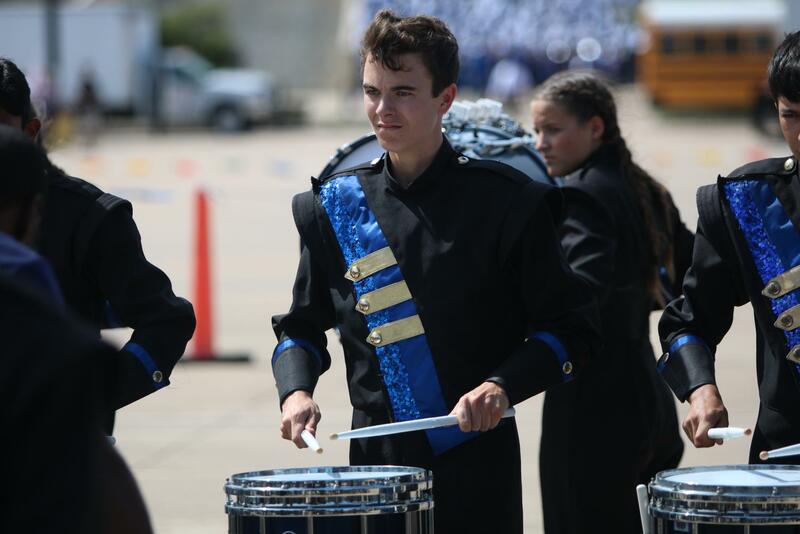 Philip Whaley (11) is one of the percussionists in the Cypress Ranch Band. The Band recently participated UIL Area Finals — a high achievement considering the competitive nature of this region. 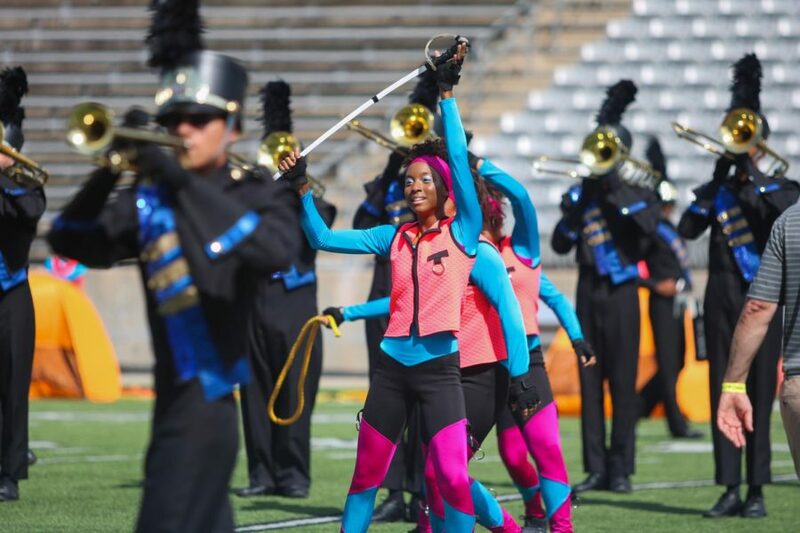 Further competitions are set to begin in the spring, as individual groups and the Band as a whole look to climb back up the ladder at UIL regional events.